Railpictures.ca - Robert Farkas Photo: It is 4:54 P.M. on a June afternoon in Toronto, and the CN Spadina engine facility is seen through a window of the CP Royal York Hotel. A float plane flies above while RDC’s and other passenger power and freight power are also seen below. There is a haze that hides the details, but much is visible. | Railpictures.ca – Canadian Railway Photography – photographie ferroviaire Canadienne. Caption: It is 4:54 P.M. on a June afternoon in Toronto, and the CN Spadina engine facility is seen through a window of the CP Royal York Hotel. A float plane flies above while RDC's and other passenger power and freight power are also seen below. There is a haze that hides the details, but much is visible. It is also interesting to see the Canadian National Exhibition in the background. The permanent roller coaster, the Shell Tower and the Grandstand are all gone now. AMAZING shot Frank. Interestingly 10 years later not much would have changed in this shot. 1981 the year I hired on CN , North Bathurst yard was no longer used. The freight shed was still standing I remember they made me carry a knuckle from the building in the foreground to one of the tracks, where and old CN reefer was parked and we had to climb the reefer and put on a handbrake. Heady stuff for a young “foamer” like me. was part of CN, IIRC) was noted as working out of a platform or two. A few tracks also went down to the CN Express building out of frame to the left. This area eventually became a parking lot off Front St. for the CN Tower. …and still studying what to do with it. Brilliant history lesson BTW; all that open space and mostly friendly rail staff everywhere. Guess you didn’t get very far AWM…. Now that as got to be a ‘rare’ view. Nice!!! Love the view, thanks for sharing. 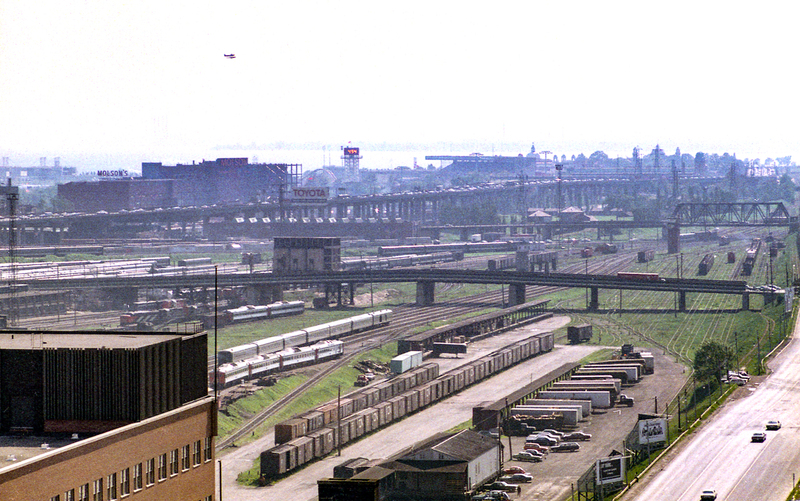 1972 and still a traffic jam on the Gardiner!